Guitar they are they played on: 2012 Manuel Rodriguez A with cedar top and neck, rosewood sides, back, and fret board. Because of all the cedar it has a very rich, warm tone. Not like Spruce top guitars more neutral timbre. Creator Description: The only reason anyone plays a cedar guitar is because they like the warm tone of the wood. I desired a set of strings that would give me that warmth but have real projection and clarity of sound while playing. This took some doing. After trying every major brand at SBM this combination gave me the best result and exactly the sound I was looking for. The sound of the Hannabach Medium High Tension trebles are fantastic! They have a clear, clean, crisp matched timbre across all three strings and all frets. At no time did the pitch go sharp, even when nearing the 12th fret, and all the natural harmonics (5,7,9th frets) were clear and rang for at least 5-8 seconds. Most fascinating was the fact that you could actually hear separation between the strings when they were played. What I mean by this is that the notes when played on the inner strings (usually D and G) sounded in such a way that you could clearly hear the inner harmonies, which usually are covered up by the louder strings, and usually sound sort of muddy. With most sets that I have tried, especially the carbon ones, the high E (E-1) is normally sharp, shrill, and tinny - almost like a child's toy piano. The High E(E-1) of the Hannabach strings could always be heard with plenty of space, even in strummed cords, and still maintained its warm sound. The Galli Genius Hard Tension bass set is a story all it's own. Want I wanted in a bass sound was good space and separation of sound on each of the individual strings, but I also wanted a very loud, clean, crisp sound when the strings were strummed. My desires were met by the Galli Genius Hard tension basses. They each have great separation and tone all the way up the fret board and have the added benefit of very loud projection. (I tested this by playing the strummed section of Malagueña) The Timbre is warm and inviting. When I play slow passages on this combination of strings I have visions of a romantic sleepy little town somewhere in Spain with just one guy slowly strumming his guitar on a hot lazy afternoon. I'm telling you, if you want to get the most clear, clean, crisp and warm quality sound you can out of your cedar top guitar you have GOT to try this combination. I know you will like it! I do and it's all I use now. 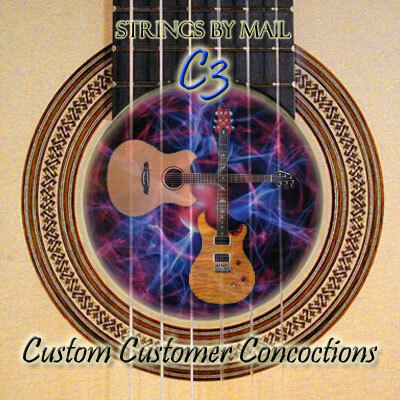 I bought this set for my Manuel Contreras II C-5 and they sound incredibly balanced across all the strings. My only gripe is that the 4th string wears out far too quickly than every other string. Right after replacing the 4th string the 5th string would start to go. The trebles outlast the bass strings 4 to 1. So, to keep enjoying that clear balanced sound on my guitar, I have buy extra 4th and 5th strings which make the purchase of this set slightly more expensive than just a single set. So mellow with punch still. They do talk to you. Makes my cedar top Cordoba sound beautiful. As always the services prompted and professional. Thanks! P.S. I love the customized string options.